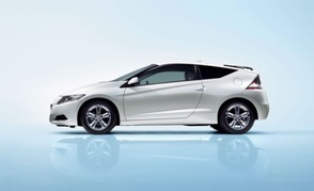 The widely anticipated Honda CR-Z has finally been launched in Malaysia. Joining the likes of the Honda Insight, this hybrid model has reached our shores, making us the first Southeast Asian country to enjoy the 3 door sporty model. Priced at RM115,000, on the road with insurance, the CR-Z hybrid comes with the 1.5 liter LEA SOHC i-VTEC engine that gets you up to 114 PS while the DC Electric Motor powered up with their IPU (Intelligent Power Unit) gets you about 14PS more. Paired with a 6 speed manual transmission gearbox, it comes with a cool 3 driving mode systems namely Sport, Normal and Economy which can be activated through a button. The Illuminated Sports Meter illuminates to a different colour scheme when a specific driving mode is activated. Coming in standard in the CR-Z are front fog lights, a 3 spoke steering wheel, rear foldable seats and despite it being a hatchback, has quite a big boot space. Dual front airbags are fitted in front while side airbags are also included. 16 inch spoke alloy wheels are wrapped with 195/55 tyres and there is only one colour available at the moment, the Premium White Pearl as seen in the ads.